Window of Opportunity for divine intervention is about to open on planet Earth. The entry point of that window is World Liberation Day on May 5th. 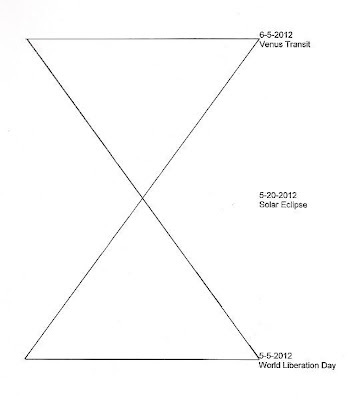 The turning point for that window is the Solar Eclipse on May 20th. 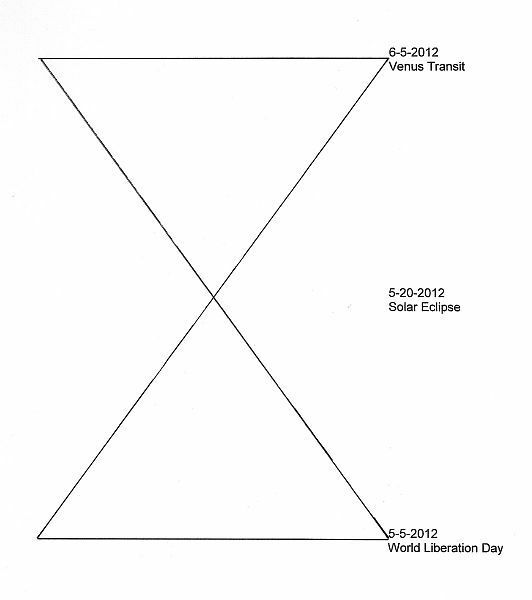 The exit point of that window is the Venus Transit on June 5th. While this window is open, the Source will be sending constant flashes of Light directly to Earth through linear phasar flow direct dimensional translation system of AN conversion. This time window is the most probable time frame for the Event. I can give you no guarantees that the Event will happen within this time frame, as we live in free will universe and the war between Light and Dark on this planet is not over yet. However, this Window of Opportunity is exatly that - a great opportunity that we as a collective make this breakthrough. Complexity wave analysis shows that this time frame is the most complex period in the known history, surpassing even the famous December 21st, 2012. This means that it will be the most volatile, inpredictable time with greatest potential ever. All the major players are involved and stakes are high. Great news if it's for real. So many prophesies, never fulfilled. The Mayan prophesies will be used according to the beliefs of the person involved, and as you know many will interpret the end time as the end of the world. We want to emphasize that there will not be mass destruction and loss of life on a great scale. That is not the plan, and since God is All Love it is clear that God would never withdraw that Divine Love in any circumstances. You are all Godsparks and whatever happens you will always remain immortal. With the end times will come a “sorting out” as souls are directed to a path that is going to allow them to continue evolving, at the vibrational level that they are already on. There would be no purpose or gain, if souls were placed in a dimension where they were not compatible to it according to their level of consciousness. So do not worry about other souls, and bear in mind that all will eventually find the path that will not compromise their freewill.In the Solar System, the planets and the Sun share roughly the same plane of orbit, known as the plane of the ecliptic. From our perspective on Earth, the Zodiacal constellations move along or near the ecliptic, and over time, appear to recede counterclockwise by one degree every 72 years. This movement is attributed to a slight wobble in the Earth’s axis as it spins. As a result, approximately every 2160 years, the constellation visible on the early morning of the spring equinox changes. In Western astrological traditions, this signals the end of one astrological age (currently the Age of Pisces) and the beginning of another (Age of Aquarius). the precession of the equinoxes makes one full circuit around the ecliptic. Just as the spring equinox in the northern hemisphere is currently in the constellation of Pisces, so the winter solstice is currently in the constellation of Sagittarius, which happens to be the constellation intersected by the galactic equator.The whole question of what the year 2012 will bring for you will have to be discussed, as rumors abound based on the different interpretations of the Mayan Calendar. The most important answer concerns the end time, which quite a few people take literally to mean the end of the world. Informed people, who have fully investigated the matter, have correctly concluded that “the end” relates only to the closing of the cycle of duality. Addressing the "God is all Love and would never allow . . . " I have heard that there are an infinite number of Earths, and also that Earth was destroyed in one scenario, so those reassurance do not work for me. That said, I believe that this particular reality will be one in which the Earth and most of its population will be raised up in Ascension. I really really hope that the event will take place in this time window. Let us do everything that can help to manifest it. This hole thing has my full support and energy, but at the same time we are using our energy to help manifest this event we must not forget that our mother earth requires much love and energy to bring about healing and help her with her transition as well. Don't forget the being that we have lived on and been maintained by for so many thousands of years! LOVE AND LIGHT FOR ALL! See the latest White Hats Report. This is getting really interesting...looking forward to the coming reports. I believe you are exactly right; our abilities differ from person to person, but I guess eventually all of us will develop the whole enchilada. I'm glad you were able to meet someone to talk to about all this. I haven't. I did meet a regression hypnotist and she offered a session for free, but anything after that was gonna cost me, big time, so I said no thanks. She was familiar with psychic abilities, however, so it was good to unload on her for a few minutes. The last time I consciously dreamed, I was in a subdivision looking for my brother. Tons of houses, so finding him was gonna be hard. I thought, what the hell, and created a chair to sit in which could fly. I buzzed all through the sky like Superman sitting in a recliner. It was awesome. If you meditate, (I meditate for an hour a day) ask who you are. It didn't come right away, but eventually I was told when I asked. So many puzzle pieces come together so fast! Thanks for the Solara post ! There are a few pages in her book Starborne: A Remembrance for the Awakened Ones on the Antarion Conversion (which I was coincidentally rereading last night :) and she mentions that her book The Legend of Althazar has a chapter relating to it as well. Also does the Event involve our solar system moving interdimensionally into the Sirian Star system at the time of the Event? A new night time sky would sure get everyone's attention! Dont know but that would be awesome! No, this solar systme stays where it is. But the veils will begin to be lifted and we will begin to see the universe as it really is. Sometime in the 90's still daylight I saw a planet so close to earth, identical to Saturn, I even saw the color rings.This planet was massive and so close,I mean really close compared to the way we see the sun and moon,no one else seemed to notice,no car even stopped.Was it remote viewing? I don't think so because the next day I went to buy the major newspaper, and nothing in that paper,well it turned out another French newspaper had a small clipping on the second page with a black and white photo and one small paragraph which I didn't understand what was written. (keep in mind I had no internet back then)Funny thing when I saw this planet it didn't even shock me.Not one person I know saw it and I have never found any info online since.How and why did I see this? That is amazing. Yes, an explanation of your encounter would be most entertaining. "Last night I dreamed I was watching a man fly a kite with a golden key on it, like when Ben Franklin discovers electricity in lightening story. This man was flying this kite high in the sky, and there was a huge solar flare that hit the earth, and what was blue sky rolled back around the kite like paper burnt from a flame so that another sky began to show through. Another man quickly ran up to touch the gold key, and when he touched it the blue sky continued to burn away leaving a new sky with different star patterns and rich colors. It made our old sky look like a paint by numbers compared to a Rembrandt. Then a voice said "Just as how lightening brought in the industrial age of Ben Franklin, so shall lightening bring in the golden age". There was this very clear connection to spirit of discovery and exploration of Ben Franklin to this new sky that was appearing in our time and lightening." I wonder if that dream is connected to all this? Ak your dreams are powerful..
GB & AK maybe one day soon the answer will come.Maybe the day I saw that planet the veil was lifted or something happened at that moment. Cobra you mentioned reunion with Inner Earth as part of the Plan. Can you write a bit about them in one of your upcoming posts? Even the open-minded ones I know find this hard to consider as truth. A good story on inner earth! Barda, thanks for sharing, if this place exists I want to visit in the future! We have been lied about so much that it wouldn't surprise me if it's true. Well done!! Great to see more videos popping up! Donerightproductions had a great comment on that video, it's the best rated atm. I very much agrre with it. "Why should this be a one-time thing? Our consciousness creates reality! We should have global meditations more often than just this one time! Can you imagine if humanity focused on positive change all around the world at the same time at least once a week?! This could﻿ turn into a spiritual revolution here! Thumbs up if you support more than just one global meditation session to send change into overdrive!" it would already change ALOT if everyone would just meditate every day at 12:00 noon in their own time zone--an easy personal habit to develope & changes would be buzzing all day long ! Thank you... This is beautiful! May I make a suggestion please? It might be that war served some purpose in the past, but created so much suffering, and so maybe a new word or energetic expression is possibly needed, to create a new form of attractor. Perhaps 'peace'. Our enemies are only real within the construct of our minds, so finding peace wthin our minds may well serve the purpose we wish to achieve. The "Event" you speak of IS the liberation of Earth/USA from the cabal, right? Or is there another 'event' that I am not aware of ? It seems that Drake is saying now that the military is not moving on anything... so we are basically in the same position as we were before....? Granted there have been arrests, and cabal in trouble and all that...but in essence, we are the same, correct? Or am I wrong? The "Event" I speak of IS the liberation of Earth/USA from the cabal. The mass arrests WILL happen.